"They're here. I'm ... don't let Snookie eat chocolate, it's poison for dogs, she'll beg you, the boy. The boy watch the boy watch the dead people oh Lordy there's so many ... They're coming for me now. We're all going soon. All of us. Bye Joanie I love the bag bye Joanie, Pastor Len warn them that the boy he's not to­­-"
Pam, whose husbands name was Jim (The Office, anyone? ), gets in a plane crash and leaves that message. Around the world three other planes crash. Pam only survives long enough to leave that message but there are three other survivors, all children, all fine. Or are they? The Three* is a book that explores the reaction of the world after this happens. On with the review! In short, The Three is one of the best books I've read this year/ ever. Sarah Lotz has managed to write something about plane crashes that is better than Lost, which is not something I say lightly. The story was insane, every twist was like a smack in the face and even though I had no idea what was going on, it didn't annoy me like it normally would. The characters all felt very convincing and real, and even though it was constantly moving from person to person it was easy to keep up and get to know them. I was rooting for people, had my heart broken as the narrative progressed and just wanted to climb into the story and try to sort things out. We see the British media frenzy- there's even a reference to Princess Diana in there, the Bible Belt of America's religious reaction, and Japans slightly better way of dealing with everything. Lotz manages to stay pretty accurate to what I think would probably happen if this freak tragedy happens, and it's a scary story in itself. I've seen people compare it to World War Z which is one of my favourite books ever and I can see slightly how that might seem but for me, World War Z is more historical whereas this is more a media spin on a story. I really enjoyed the way this book was set out with prose then a book within a book, then more prose. It was a little Hamlet, a play within a play. I used to love reading these true crime books when I was a kid and that choice of formatting really made this book 'pop'. I don't think it would've been as good if it was just straight storytelling. I was totally hooked, unlike Bird Box, I could not put this book down. I stayed up late into the night hunched over this book when I got to the last 50 pages and immediately took to twitter to vent my pent up feelings. And that ending- the ending. Oh. I had no hesitation when rating this. I don't hand out five stars that easily but this is one of the best books I've read this year. Hands down. If you want to buy this book and you should it is on Amazon here! 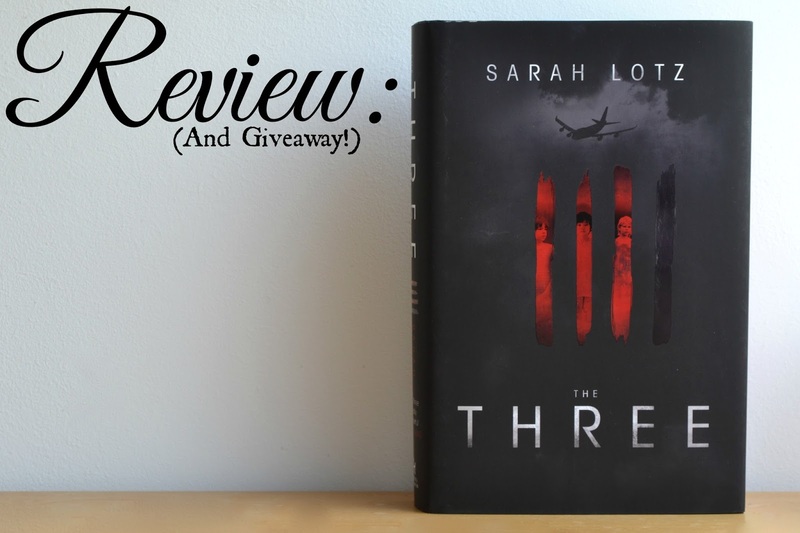 Luckily I've been given the opportunity to give a copy away and all you have to do is enter the Rafflecopter below! Which ends Friday the 13th of June because I thought it was fitting! Do you think you'll pick The Three up? *I was sent this book to review by the publisher. This is completely my honest opinion. The book being given away is being provided by the publisher for one of my readers. I am not responsible for delivery. This giveaway is UK only. If you're under 18 please ask a parent or guardian for permission to enter. I've read so many good reviews praising this book that I'm very anxious to read it.